Blog from Nazca, Peru | Margaret in Wonderlands.. So we did the sand buggies and it was so much fun. We had Jose who was our driver and he really did scare the sh** out of Ellen. I sat up front and I loved it but Ellen was directly behind me and my ear drums got a good battering to say the least. There was also an American couple with us. The sandunes were absolutely AMAZING. It was just mountains of sand for as far as the eye could see. Although when we got to the first spot to take pictures you could see all the cities, like ICA. 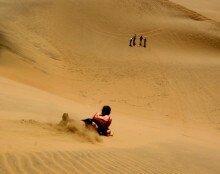 We took a few pictures and carried on the ride over the sandunes and up steep climbs and down on our side practically. Sometimes you could not see where we were heading it looked like the edge of the dune.. we also went down steep ones. It was brilliant and I loved it. We then did sandboarding. I was disappointed that I did not do it properly in NZ so I vowed to do it here. The sandunes were massive compared to NZ and there were 4 different ones all getting more steeper. I did 3 out of 4 as one was really bumpy and I did not want to risk hurting my foot anymore. After a lot of fun sliding down them on our boards we went to watch the sunset at the top of one and it was beautiful. Later on we went for dinner and drink at our favourite cheap restaurant before we headed for bed. The next day we had a breakfast with our Ozzie room mates and headed for the bus to Nazca. 2 hours later we had arrived, we booked onto a car tour of the Nazca lines. It was about $80 to get the plane and these apparently can be dangerous. I decided to do the car as Ellen did not want to do the plane and I just wanted to see some and get an understanding of what they looked like and the theories behind them. The geometric ones could indicate the flow of water or be connected to rituals to summon water. The spiders, birds, and plants could be fertility symbols. Other possible explanations include: irrigation schemes or giant astronomical calendars. We had a French couple in the car with us and they had little English so between a bit of English and broken Spanish we had small conversations with them. We first went to the lookout which was a little mountain of where the Nazca lines begin. There were loads of lines that were straight and went off in several directions, they were not particarly wide. The lines are apparently 2 million years old and many theories vary. The most common of course is some aliens created the lines and another is that they were made by some sort of civilisation who lived there and made the signs as an act of prayer to the gods. There are thousands of them. We then went to a look out station and looked over the tree shape (which was seperated by the motorway) and one that looks like a hand. Our next stop was a musuem by a German lady who devoted a lot of her life to studying the Nazca lines. The last stop was to a station which overlooked the signs which looked like little humans. As you can imagine it was very barren and dry out there and the mountains went on for miles. It was interesting to see them and they are quite fascinating. Whatever created them they sure went to a lot of work to complete them and they were very impressive.